Today is the last 2017 tour in the Charming Home Series. We’ll be back in the New Year right on schedule with another amazing home tour. The first home tour in this series was my friend Dawn’s home at Creative Cain Cabin, almost 4 years ago! That’s a lot of houses we’ve been touring. Before you’re off to celebrate New Year’s Eve, I hope you’ll stick around to enjoy today’s amazing farmhouse renovation by Renaissance Partners, LLC. The vision for this home’s renovation was five years in the making. I think you’ll find the vision was spot on. 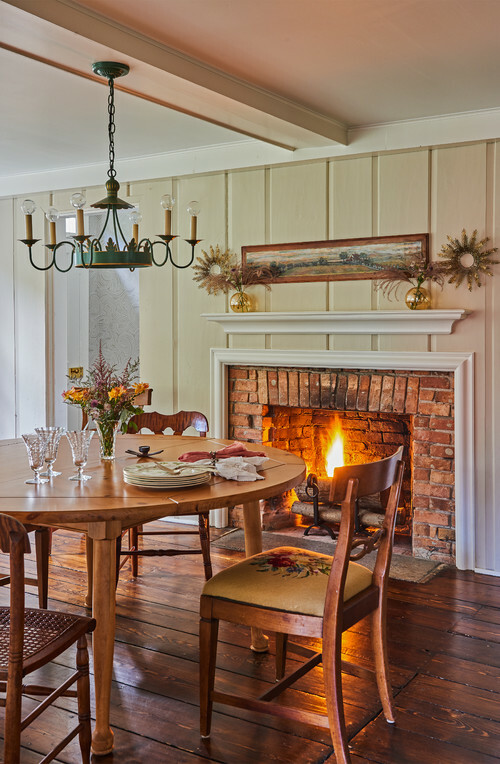 Wooden wide plank floors and a brick fireplace create cozy warmth in the dining room. The kitchen features a current trend of painting lower cabinets dark and upper cabinets white or a lighter color. 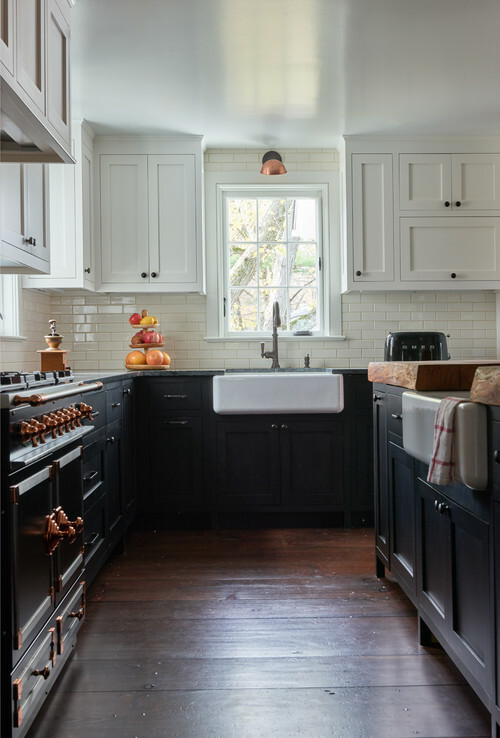 An apron sink and French range keep the country flavor of the farmhouse renovation. 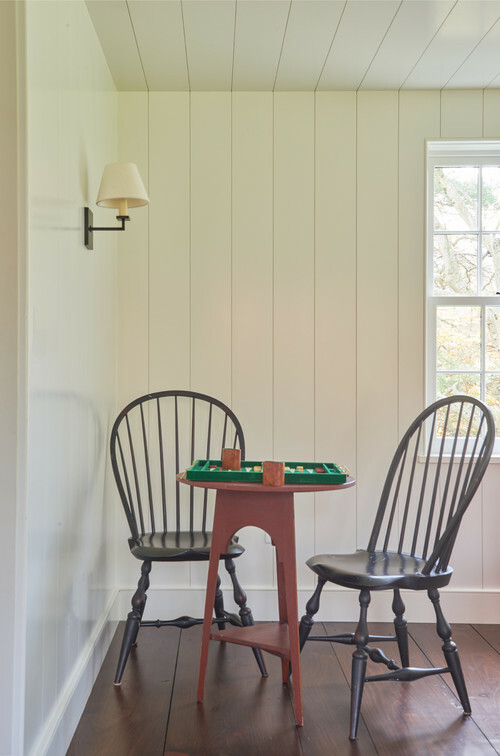 Windsor chairs cozy up to a game table in the family room with painted planked walls. 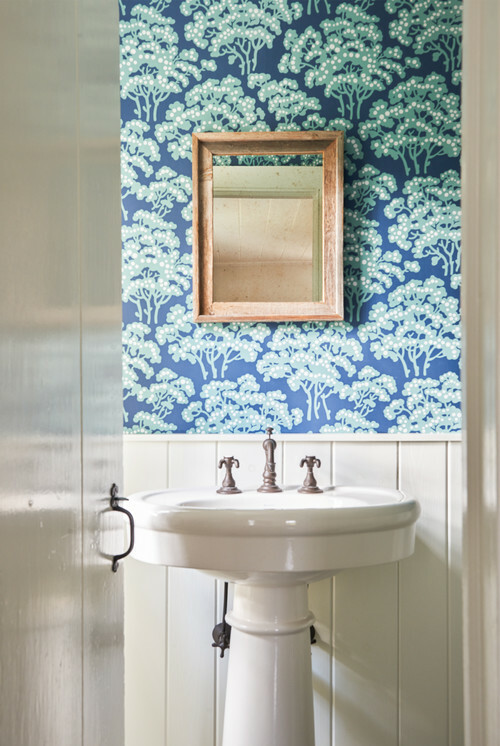 Wallpaper is making comeback, as seen in the home’s blue and white powder room. I’m seriously considering adding wallpaper to the downstairs bathroom. The master bedroom is decorated simply, allowing the rich wood floors to stand out. 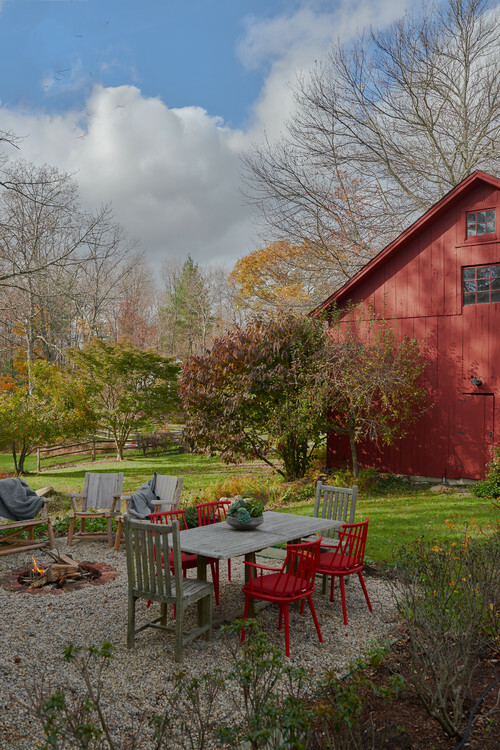 Just outside the window is a glimpse of the property’s beautiful red barn. 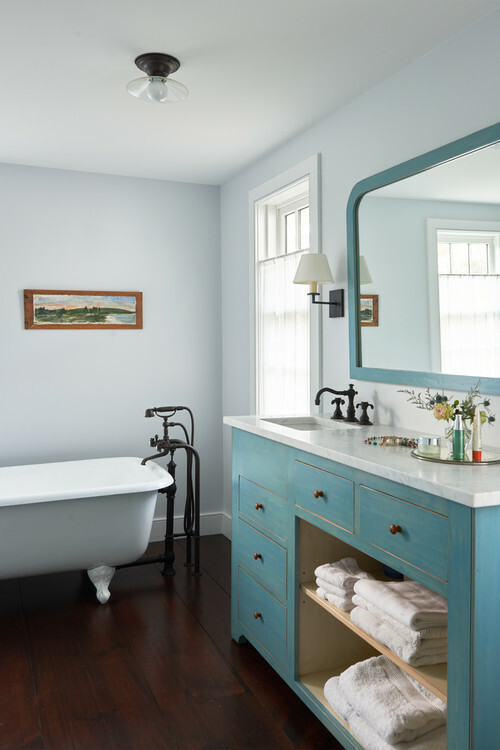 Rather than create a luxurious state-of-the-art master bathroom, the master suite enjoys a simple farmhouse style bathroom with a beautiful claw foot tub and blue vanity. 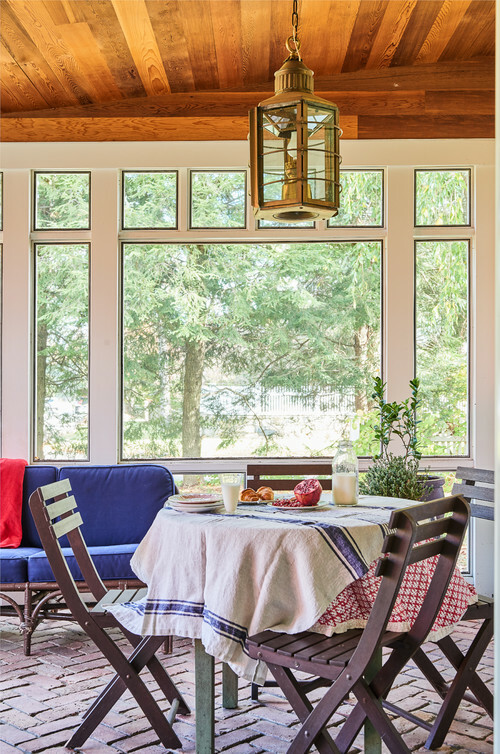 The farmhouse renovation enjoys a beautiful porch with brick paver flooring. I once toured an historic home with brick flooring in the entryway and kitchen and loved the look. I don’t know how comfortable it would be cooking in the kitchen, but a porch is the perfect place for brick pavers. 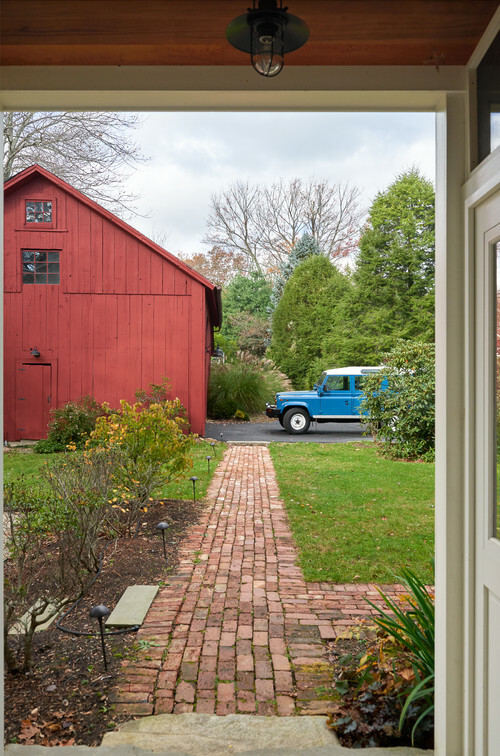 The grounds of today’s farmhouse are equally charming with a red barn garage. A pea gravel patio creates a quaint spot for outdoor entertaining and dining. 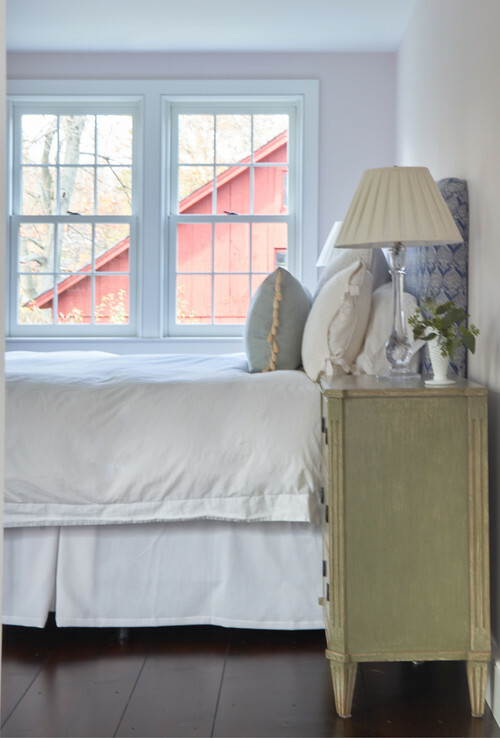 You can see more of today’s farmhouse renovation over at Houzz. It is a beautiful renovation. I really enjoy the simplicity of this home. Brick floors just make my heart skip a beat. Guess that’s why I love your kitchen so much! Hear’s to richest blessings in 2018. The whole house is lovely but I was really attracted to the dining room. In particular I loved the chandelier and the simplicity of the fireplace surround/mantle. Wouldn’t it be nice to eat in front of a fireplace? It almost makes me want to move my dining area to my living room area where there is a fireplace. Let’s all pray for a healthy and peaceful 2018. I sure have enjoyed your home tours over the years, Jennifer. They’re a favorite of mine. Happy New Year! Many strive for farmhouse style and it seems to be the trend currently, but this home captures the true sense of Farmhouse. Lovely. Brick floors and kitchens are my favorite, a very true farmhouse renovation.